Here is above a rare rendering of DLP's Frontierland and what is great with it is that the three Frontierland attractions are shown on the same image. I think the artist is WDI artist Frank Armitage and it was done as an early atmospheric piece, while imagineers were still in the concept planning phase at WDI in Glendale. 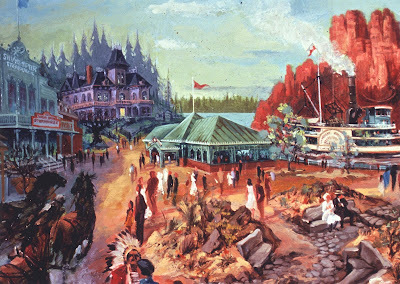 In other words, Frank took some of the elements imagineers knew they wanted - Phantom Manor, Riverboat Landing, Molly Brown, Big Thunder, the Silver Spur Steakhouse Restaurant, etc - and composed a street and river scene of what Thunder Mesa would have looked like as an old wild west town, filled with activity. Although it is an early concept, it's amazing to see that everything that will be built at the end is already there! Frank Armitage is the same artist who painted the huge painting hanging in the lobby of the Disneyland Hotel with all the people in Victorian costumes. Artwork: copyright Disney Enterprises Inc.
Nice piece. I love coming here and finding rare WDI concept art. Thank you.